​I'm really enjoying this series about the Whiskey sisters, set in Minnesota, and this one was even better than the first one which I also enjoyed. This time we get the story of the second sister, Jameson, who runs and owns O'Hallorans with her sisters, the Irish pub in their town of Mayhem. She is recently divorced from Win and they have a small son called Jackson, a holy terror but very, very funny too! Her father-in-law, Big Win, collapses and is rushed into hospital on life support in a coma. So the family rally around, and 'missing' son Scott comes back to be by his Dad's bedside, as he is also his Primary Healthcare Proxy, with Jameson as Secondary Healthcare Proxy, leaving Win out entirely. Win and Scott have a very antagonistic relationship, hardly surprising since Win is a complete pain the behind anyway, and so there is quite a bit of hassle going on. There is also a secret that Scott thinks he knows all about, and is the main reason he left town 10 years ago to work for the Peace Project around the world, but in fact things are not as they seem and nasty Win knows more than he lets on. Jameson and Scott start getting closer, but of course Win doesn't like it and creates grief for everyone, that luckily gets resolved in the end, with involvement from the pie lady and a mad dash to the airport! There are some great characters in this series, I'd love to know more about the pie lady, and there's also the (very famous) shop that knits outfits for small animals, all mad but very, very appealing! I'm assuming this series will continue with the other two sisters and I am really looking forward to returning to Mayhem and catching up with everyone. Very entertaining. This was such an awesome book! This is a new to me author, and I was so excited when I started reading and couldn't put it down! The writing flowed well, and I loved all the characters. The O’Halloran sisters were great, and it was interesting to see all the sisters named after whiskey. Jameson and Scott were great together. You could tell that they really got each other, and were perfect together. Win was a jerk, and I really couldn't believe the extent he would go to make the people around him miserable. I know family is important, but I don't think that I could have forgiven him, and let him stay in my life in any capacity. I have to say there were several times that I teared up. The end especially got me. I can't wait to read the rest of the sister's stories! I voluntarily reviewed an advanced readers copy of this book. 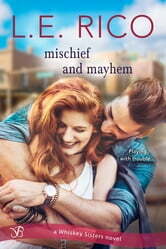 MISCHIEF and MAYHEM by L. E. RICO is a wonderful crazy romance! This was a very fun read, a story with lots of love. At some points I was laughing out loud! I'd love to visit Mayhem again. Lots of interesting characters with amazing gifts.